Holding My Grandson is a Reminder of Foster Kids’ Needs! Laurie Roberts recently published a column in the Arizona Republic titled “The most amazing Christmas gift of all is a child in the family again.” She shared how becoming a grandparent for the first time was a wonderful, life changing experience. 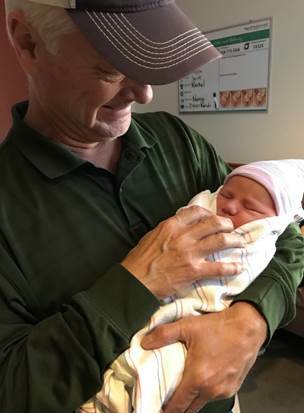 I too became a grandparent shortly before Christmas. For me it was my third time, each as precious a gift as the first. Being a grandfather is even more rewarding than friends and family have espoused. I am able to share deeply in a child’s growth, lavishing love and support – all without the responsibilities we all faced in parenting our own children – there’s nothing better! It’s so much different than having the 24/7 responsibilities of a parent. Holding my grandson I can dream of a future filled with love. My grandson’s birth was another of many reminders of the importance of the work we do at Arizona Helping Hands. Every day we lend support to families, most of whom were not expecting a baby, youngster or teenager to become their responsibility at a moment’s notice. My grandson was born into a two parent stable household. He will have the love and support of Mom, Dad, sister, grandparents and others within a network of caring relatives. He was born free of substance abuse issues and other congenital defects brought on by outside influences. Very much different from the little baby girl we met recently at Arizona Helping Hands. She was born addicted to multiple substances. The chemicals in her system affected many of her functions – a deformed arm, a cleft palate and difficulties focusing were just a few of the issues she faces from the start of life. What will her future hold? Children are so precious. The utter disregard that moms and dads have for innocent lives they conceive and bring into the world is truly appalling. Holding Aidan in my arms I experienced such a beautiful gift. This little being is truly precious. How anyone can take actions that put a baby in danger is entirely beyond me. That little baby girl to whom we provided a crib, clothing, diapers and more had no say in the conditions to which she arrived. Thankfully the foster family with whom she was placed has chosen to put her multiple and intensive needs above their own – just as any responsible parent would. She and all the babies we meet deserve nothing but the best. It would be fantastic if drug issues did not exist in today’s society. If all who gave birth to a child had their priorities straight and put the lives of innocent babies above their own bodily cravings. Unfortunately, not every baby will be born into a caring household. It’s up to the rest of us to try and pick up the pieces, provide support, safety, comfort and more to children who are placed in foster care. I say thank you to the community that provides Arizona Helping Hands the opportunity to assist these babies, and to lend help to foster parents who are called in to try and make things right. We are proud to walk beside you and support you however we can. We help with all the basic essentials we can, and add to this a heaping supply of love from every member of our team. Laurie Roberts wrote about her granddaughters’ “circle of family that will embrace her tonight, tomorrow and always.” I pray that children in foster care will find their own circle, and that we as a community can expand our circle to provide love, safety and hope to assist Arizona’s 15,000+ children in foster care.